Nestled in downtown Heber Springs, you will find quite the artistic experience at Ellen Hobgood Gallery. Whether you are looking for an art fix, searching for the perfect addition to your space, or ready to work with an artist in crafting your own piece, the Hobgood Gallery is waiting for you. Entering the gallery, you may feast your eyes on an eclectic mix of local artists from all across our state. 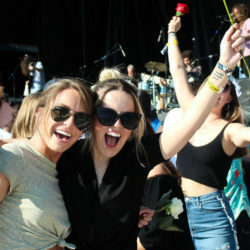 Owner Ellen Hobgood wants your experience to include inspiration and enjoyment. Selling the artwork is not her only objective; she also wants you to get lost in the artistic talent. The artwork within the gallery is not limited to one style of visual art. Within the walls, you will find paintings, drawings, wood carvings, paper sculptures, pottery, jewelry, fused glass, ornaments and much more. Those who roam will find a broad and unique display of artistic skill. 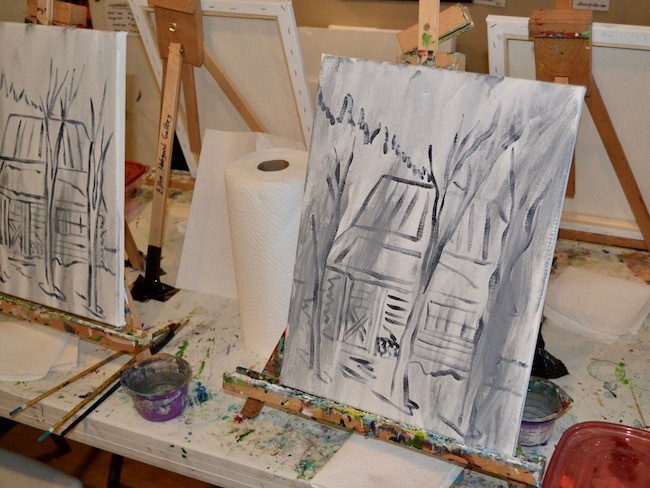 The gallery also offers private painting and drawing lessons along with group parties. When I inquired about the reasoning behind the private lessons and parties, Hobgood said it is about growth, expression, and sharing. The gallery is an expression of her voice, and being able to teach someone gives them a chance to express themselves. Fortunately, I have had the opportunity to take lessons and attend numerous group parties, and I can say the experience is unlike any other paint session I have tried. When you create in the Hobgood Gallery, either in private lessons or at a group party, you are working very closely with an artist who has a vast range of experience. Hobgood has painted more than 200 murals, locally and in the region. She also works with numerous charities and has donated artwork to the Family Readiness Group for soldiers returning from Iraq. 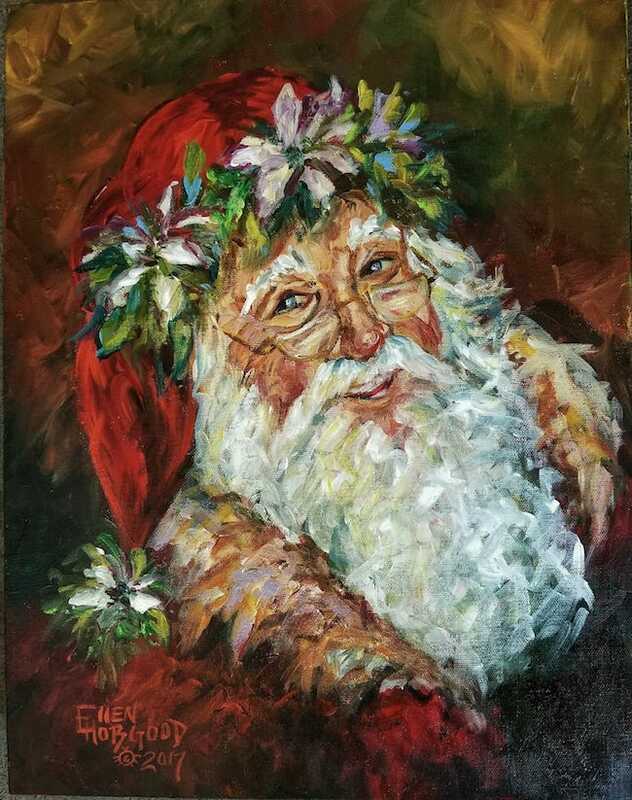 Hobgood was honored as a featured artist at the Arkansas Children’s Hospital after donating one of her well-known Santa pieces. The hospital continues to display her Santa each year as part of their Christmas decor, one of the few pieces Children’s continues to include each year. 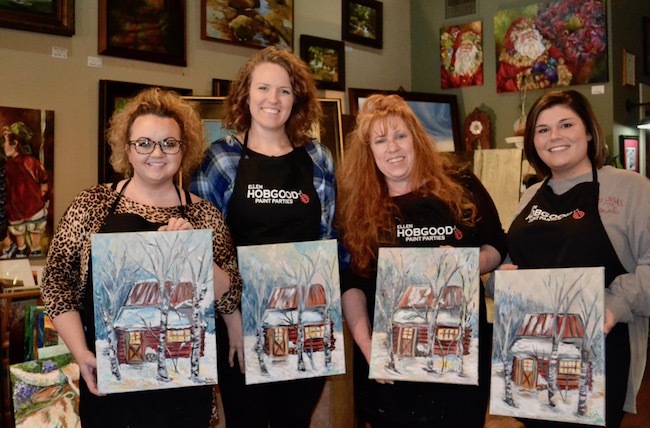 Recently, I was seeking a fun, cold-weather event for a group of friends and we settled on hosting a Hobgood paint party. 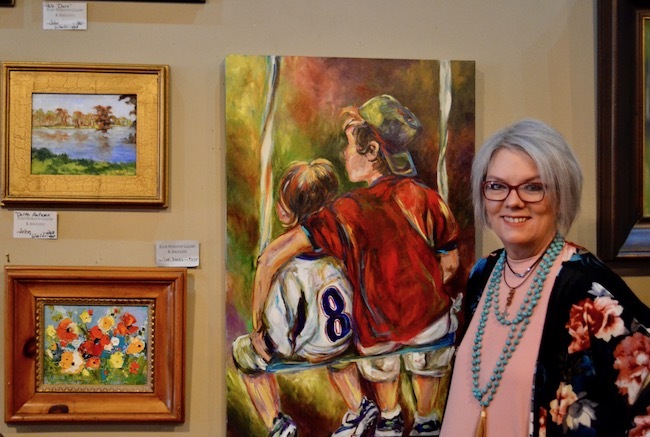 We have attended many paint party sessions at other locations, but we find ourselves returning to the Hobgood Gallery for her latest creative challenges. 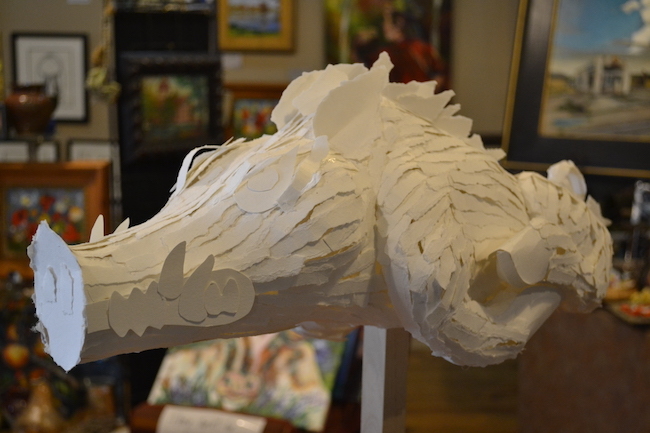 After a gathering at the Hobgood Gallery, you walk away with more than a self-crafted masterpiece. As you create, you also gain technique, proper brush handling, and skills with paint layers and colors. Each time you enter a session, the pre-sketched canvas brings anxiety as you doubt your ability to create. But, as you progress with an artist by your side, you find your creativity unites with your newly obtained skill. With every session, I can still say I learn something new: a different way to layer, a new skill, or a unique brush technique. With the gallery’s beauty surrounding you and inspiring you to create, you find time slips away, leaving you lost in your own artwork. As you laugh along with friends, covered in paint and munching on snacks, suddenly your artwork emerges. Much to your surprise, with the right guidance you can paint! As someone who considers themselves low on artistic talent and skill, I have yet to leave with a painting I do not proudly display in my home for everyone to see. 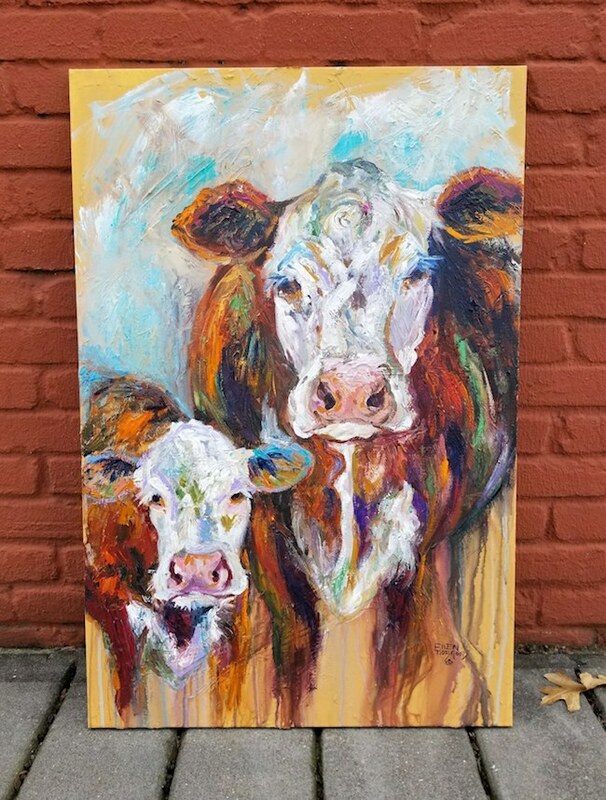 Whether you are searching for inspiration, locating a masterpiece for your space, or need an activity for all to enjoy, I hope you consider stopping by Ellen Hobgood Gallery.